MEDITERRANEAN cuisine is on the menu at Le Petit Greek. Waiter dishes out a “taste” at a previous event. 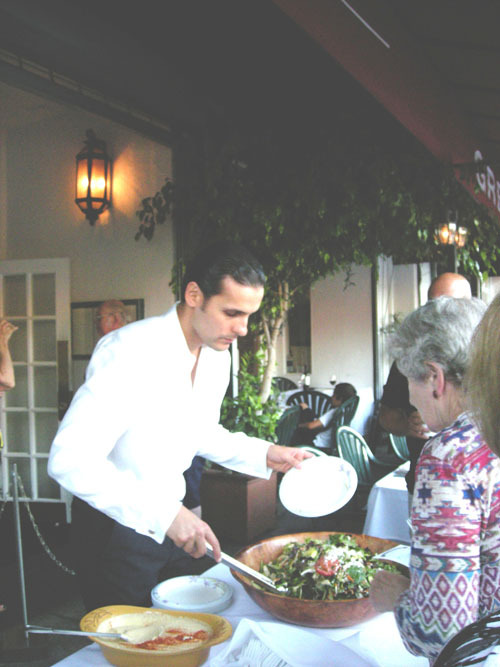 The 21st annual Taste of Larchmont on Mon., Aug. 26 from 6 to 9 p.m. will give diners a “taste” at 20 Boulevard restaurants. Live music and entertainment, a raffle with dinners at local restaurants and diamond earrings as prizes, and a silent auction are scheduled. The event raises money for HopeNet, which supplies food pantries at local houses of worship. The non-profit celebrates its 25th year, and event co-sponsor the Larchmont Chronicle turns 50. “Taste of Larchmont is Hope-Net’s main fundraiser each year. It’s a wonderful opportunity to stroll the Boulevard and meet up with friends, with the bonus of knowing that you are helping to fund Hope-Net’s 13 pantries,” said Gillian Wagner, HopeNet board president. Participants include California Roll & Sushi, Chan Dara, El Cholo, Hamburger Hamlet, Kiku, The Larchmont, Larchmont Deli, Le Pain Quotidien, Le Petit Greek, Louise’s Trattoria, Pinches Taco, Prado, Village Pizzeria and Z Pizza. For drinks, stop in Larchmont Village Wine & Spirits, Coffee Bean & Tea Leaf and Go Get ‘em Tiger. Desserts will be courtesy of BabyCakes, Baciami Café, Café Gratitude, Crumbs, Fancifull Foods, Lette Macarons, Wilshire Boulevard Temple and Yogurtland.